Summary: Papier-mache tea-caddy with floral decoration, cockatoo's and parrots. 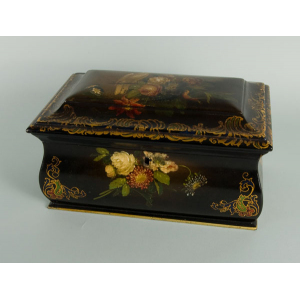 Description: Japanese lacquer work first became popular in Britain during the seventeenth century, by the eighteenth century British manufacturers had adapted this ancient craft form and a 'japanning' industry was born in the Midlands, especially in Wolverhampton. The manufacturers of this tea caddy, Jennens & Bettridge, were renowned for producing high-quality japanned ware. Quality pieces of japanned ware were made using a papier mache base. 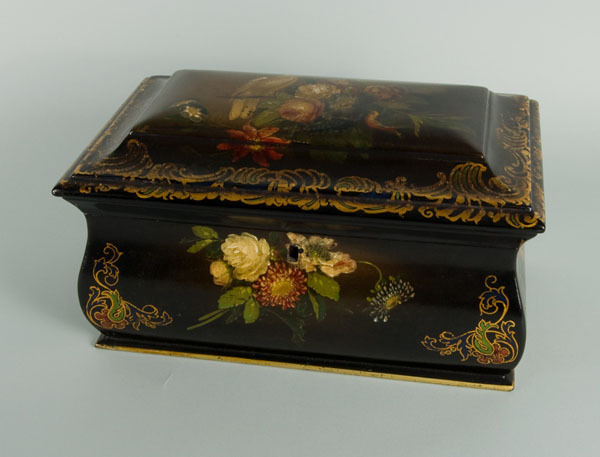 Tea was expensive during the time this tea caddy was made (1840 - 1850). Tea would have been stored in the decorative compartments on either side of this tea caddy and mixed in this glass dish in the centre of the caddy. Drinking tea was not the informal social occasion it is today: in nineteenth century society there were unspoken rules on the correct etiquette of taking tea.